Joseph Boateng: How would you invest in hope? 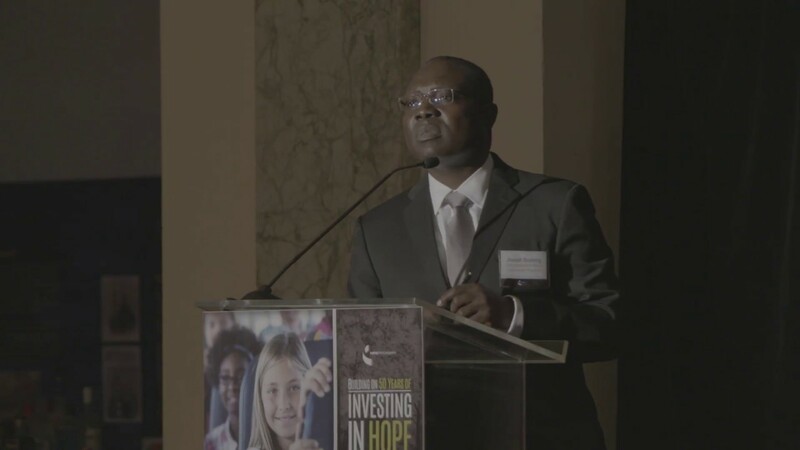 Casey Family Programs Chief Investment Officer Joseph Boateng delivered the keynote address at the Casey Family Programs Investing in Hope dinner on October 19, 2016, in New York City. Thank you, Dana, for your work and support for the youth. Thank you for investing in the youth, and above all for your support for Casey Family Programs. You’re an important asset manager of ours. I would like to go back to my days at Johnson and Johnson when I decided to join Casey largely due to the mission. I would like to note that Dana was one of the first people to send me information about the work that Child and Family Services, the social problems that we have in the country. You sent me the book called, “A Guy[Child] Called ‘It,'” and I learned a whole lot. I was totally oblivious of these issues that we face as a nation so thank you for your work. In your book bags, you would see this week’s edition of The Economist. I’m referring to it for two reasons. The first one is that it really falls on me not to stand between you and the elections – you know, the debate. So I’ll try as much as I can to get you to the debate for those who are willing. We’ve had very inspiring stories tonight, and before I go on to a few comments, there are a lot of thank yous and gratitude to give. First and foremost, I’d like to thank all the invited guests who have come from far and near to help us celebrate our half century event. Thank you, Jared. Thank you, Antoine, amongst other folks. I also want to thank our asset managers. Without you, all our dreams and wishes will amount to nothing. Because of your efforts, we’ve been able to invest over $1.3 billion from investment gains over the past 10 years. When you factor in the global financial crisis, that is quite something. Without you, we couldn’t do it. Thank you for that, and we have a number of you here. We really appreciate you keeping us in business. The same goes to our trusted business advisers, our custodians, Bank of New York Mellon, amongst others, and the lawyers who protect us from many bad stuff. We also want to thank our partners in the field, those who invest in hope every single day. Commissioner Carrion, thanks for your work. It is because of hope, or investing in hope, that one would assume a job or a position where you have a high probability of having a CLM, a career limiting move, or having some bad consequences in spite of the sacrifices you make. Our thanks also go to the board, the executive team and fellow employees at Casey. Without you, our work on the investment side would amount to nothing. I also want to thank my colleagues on the Investment Team and former colleagues. I have Cheryl who came from Vancouver. Thanks, Cheryl, for all the work. Medoe [phonetic], you cannot hide, wherever you are. Thank you for the work you continue to do with us, comparing notes as we go about investing globally. And above all, our families, including our extended families. I have many families for those who don’t know. So I’d like to say that my wife, Akosua, to other spouses, Jacklyn. We have Mary somewhere amongst us. Melinda, who couldn’t be here with us here – thank you. We also have Jason, Debbie, and Chucky Sr., Abdele, and Katy are extended family. They actually provide housing for us as we travel. Lucy and Lola, thank you. Thanks for your support, and for all those who are not included in this subset, we thank you. Without you, we couldn’t have this event. We thank you for the support you give us through thick and thin. Your support and education has kept Jim Casey’s hope and dreams alive. If you would indulge me for a few moments, I would like to highlight a couple of things. So on pages – not just the cover – if you go beyond, you know, the upcoming debate – if you go to page 28 and 29 in this book, there is a message from our CEO about investing in America’s children, investing in hope. That’s our future. That’s human capital. That is creating an income stream. That is the work most of us do in this room. There’s also a question from a 10-year-old girl who says, where would I be in 10 years. There are many answers to this question, and I’m sure you all have – for those of us who are parents – kids, whose future we plan meticulously. But we also have to think and worry about their classmates. Where would they be in 10 years? This is a profound question and I’ll come back to it in a moment. I also want to talk about the cost of abuse and neglect. That has been mentioned in various comments tonight. One of them being, you know, in the next 24 hours, beyond the debate, four kids will probably die from abuse and neglect. 711 children will enter the foster care system. There are other statistics which are quite grim and you also find it in one of the handouts in the book bag. If you look at it from another angle, you have about 400,000 children – it used to be 500,000, it’s now 400 – which is good, but we have 400,000 children who touched the foster care system every year in this country. That is way too many kids touching that system. But I also want to note that those 400,000 children, each one of them has the potential to be a Jim Casey, has the potential to be a business owner, has the potential to be an employee, a community leader, a doer, and also has the potential to be the customer of the products and services that we sell. Now, the challenge of harnessing this power, the hope, the potential that they have lies with each one of us, not one person. Whether you’re in business, whether you work in child and family services, whether you’re managing assets for Casey – because if you don’t make money, you may have to take some kids with you. That hope lies with each one of us. It’s sort of ironic that we are in the Museum of [American] Finance and we’re talking about a power that is greater than compound interest. Yes, there’s no power greater than the hope for a better life. It is hope that is the reason why a mother of a four-day-old baby – I said four days, not four years – would brave the oceans on an open raft in search of a better life for that baby. It’s because of hope that we are all here today, and it’s because of hope that you have both a juvenile justice system and also run the child and family services. It’s because of hope that a young man will walk by road on foot from El Salvador to San Francisco and be making valuable contribution as a productive adult. So how would you invest in hope as you join us tonight? We have some suggestions from the back of the fact sheet. Would you mentor a youth? Would you offer internships? Does your company have policies that support the needs of families? Can you share your expertise with the community, or will you do something else which is not mentioned here which could have a profound effect or impact on a youth’s life? It’s quite urgent in the futures of these youths, and vulnerable families cannot wait. And I would like to say that the fastest way to instill happiness is to instill hope in the hearts of others. So as you reflect over the convening that we are having tonight, as you think about what Casey has done over the years – your meetings with us when we talk about the not-for-profit aspect of the work, the reasons why the Investment Team exists – I would entreat you to think about what you would do tomorrow to invest in hope; to invest in the future of America’s children. There’s so much potential out there, and we need to harness that, and it doesn’t depend on one person. And now for a few closing words, please join me in welcoming our CEO and president, Dr. William Bell, for a few comments. Please invest in hope, and thanks for all your work. Think about what you would do tomorrow to invest in hope; to invest in the future of America’s children.